“Fed up of coming home from holiday to an empty fridge?” ask Tesco as they announce #VirtualTesco – their first ever virtual store in the departure lounge at London’s Gatwick airport. 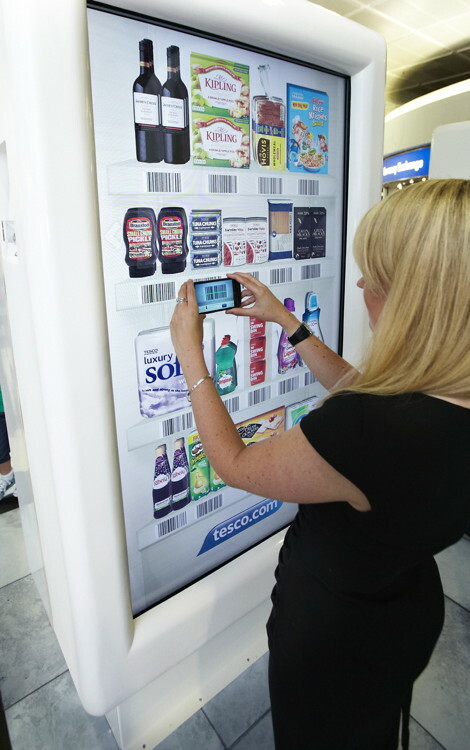 There are four interactive fridges in the virtual store pilot and six digital sites positioned around the departure lounge for passengers to use. Customers need to download the Tesco app from the App Store, Google Play or Android Market to scan products using their smartphone (oh and they need to register with Tesco.com). Customers select ‘groceries’ from the app and then they select a home delivery slot and can book a date up to three weeks away. Customers then select the ‘scan’ option and scan the barcode of the product they want on the virtual fridges (with the app they can also access thousands of other grocery products widening the range of products available to buy). The smartphone will bleep when the product is scanned. This Gatwick virtual store builds on Tesco’s launch of its first virtual store in South Korea last year. The Korean virtual store allowed commuters to shop in subways and at bus stops by pointing their mobile phones at billboards. Tesco is now trialling the concept for the first time in the UK, but this time using interactive digital displays. This entry was posted on Wednesday, August 8th, 2012 at 07:19 @347 and is filed under DailyDOOH Update. You can follow any responses to this entry through the RSS 2.0 feed. You can leave a response, or trackback from your own site. What I love about this campaign is how it combines knowledge of the passenger mindset and customer journey with the latest media technology. It all comes together for the customers’ benefit not just for technology’s sake. Great collaboration between Tesco, Eye, Initiative, Rapport and Monster Media. Not convinced. You still need an online account and an app on your smartphone, just like you do to shop via your smartphone at their online store, so rather have the screen only serving one customer at any one time, why not use the screen to promote purchase by users’ own handsets – the opportunity to ‘scale the sale’ is therefore much greater and customers can do so knowing that not everyone can see what brand of sanitary wear you prefer. The experiment in Korea made much more sense because a large wall meant more SKUs (hundreds as opposed to only 80 on this interactive screen) but more importantly it meant loads of people could shop simultaneously and sales are surely a KPI of a project like this? Why not wrap a wall instead? I’m sure EYE or JCDecaux would oblige. This is how dooh and mobile can play together. Obviously the shopping experience on your own smartphone will be better and more convenient than what the display can provide. The goal of the display is just to get you started, specially if you don’t have the app. Once you have the app, there’s not point on approaching the display and that’s okay because it already did its job.